Boycotting Businesses That Sell Fur: Yes or No? I took this photo last month in my local Nordstrom location. 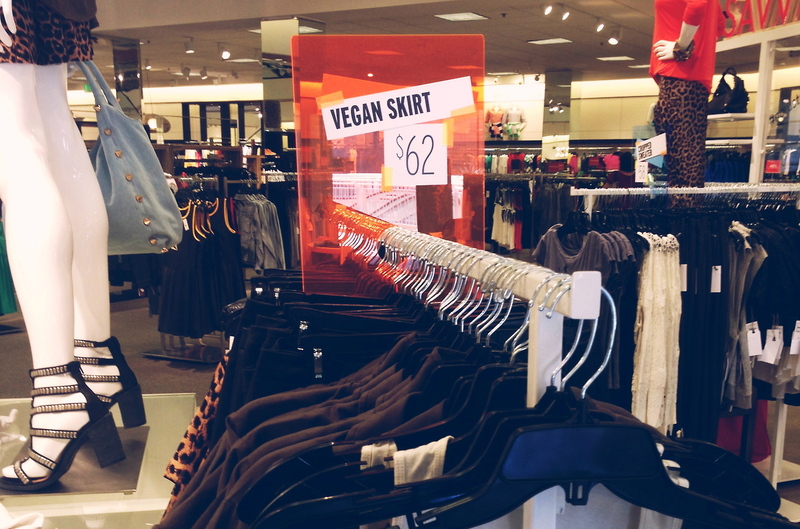 This “vegan skirt” sign caught my eye (thanks to its prominent display) within 15 seconds of entering the store. My first reaction was to be thrilled; five years ago, Nordstrom would never have boasted “vegan” skirts, but rather would have hidden them away due to the cheap/tacky stigma that faux leather has held for decades. To me, this marketing is clearly a sign of the times. A sign of change. A sign of growing demand for animal-free materials. A sign of an evolving movement of compassion seeping into fashion. Despite all this excitement rushing to my brain, I decided not to share the photo, because many activists I know (myself formerly included), boycott department stores or designers that sell fur. If you’ve followed me for a while, you know how involved I’ve been in anti-fur campaigns. I’ve hosted protests, organized petitions, and been part of multiple successful campaigns resulting in retailers ceasing to sell fur. I’ve obsessively referred to HSUS’s “Fur Free Retailers” list to ensure that I didn’t give money to designers unethical enough to use fur. However, I was recently out shopping and my phone experienced a glitch that prevented me from checking the list. This first plunged me into a panic (I was in a rush to find a dress, and was now lost in a sea of ambiguous garments! ), but then caused me to think. Am I really accomplishing anything by boycotting stores/designers that sell fur? Or am I being counter-productive? The evolution of this dilemma came for a few reasons. First, why am I boycotting stores that sell fur and not those that sell leather? Are they not both skin ripped from animals that wanted to live but instead suffered brutal deaths? What about stores/designers that sell wool? Second, how is this different than me shopping at Whole Foods, which sells a hell of a lot of dead animals. I’ve even dined at restaurants in Vegas that still sell foie gras, simply because they also offered a full vegan menu! Third, could I possibly be harming the cause I fight for daily by not supporting progressive steps made by non-vegan businesses that are experimenting with cruelty-free fabrics? Recently, I was helping my boyfriend shop for an outfit to wear to a celebratory dinner. It’s challenging to (quickly) find high quality men’s suits or jackets that contain zero animal products, so we had our work cut out for us. We finally wandered into a John Varvatos store, where 95% of the inventory used wool and/or leather. We asked an employee if they had anything without animal products, and he immediately returned with an incredible outfit made solely from cotton. In this scenario, you have two options. You boycott the store for selling animal products, or you encourage them to create more alternatives by not only vocally seeking out but also paying for the vegan option. To me, the latter option seems more impactful. Personally, I spend most of my time and money supporting and promoting innovative, forward-thinking, eco-friendly, vegan brands. I would rather pay money for a bag from a progressive start-up like Krze Studio or Leni Penn than for a nylon “vegan” bag from Prada. However, when it comes to looking for something not yet easily obtained by a 100% vegan brand (like a men’s suit or a cocktail dress), it seems all my options are flawed. Of course, I have the option of excusing myself from the consumer-driven world and living off my own land, but I doubt the influence that would have on our capitalism-driven society. As unfortunate as it is, the society we live in is driven and (more importantly) changed by money. We vote with our dollars, and businesses are paying attention. To be clear- I do believe boycotts are effective under certain circumstances. If part of an organized campaign, I think this tactic is crucial. To this day, I’m extremely upset if any of my friends shop at Intermix, a company I spent months organizing protests and boycotts against. In that case, however, Intermix knew they were a target, and they were monitoring our impact on their business. If I skip going to Nordstrom because they sell fur, I’m not sure how effective that will be. And in fact, I worry that by vegans refusing to shop anywhere that sells animal products, we won’t demonstrate the demand for cruelty-free products. Anyway, to sum this all up- I’ve spent a lot of time viewing the situation from both sides, and I’m still not 100% certain where I stand. I’m totally open to hearing alternate points of view, so please feel free to leave comments! What do you think?